"This is absolutely the best icing I have ever made." Wipe the bowl of an electric stand mixer and the whisk attachment with lemon juice to remove any trace of grease. Add sugar and egg whites to the bowl. Whisk sugar and egg whites together in the bowl of the stand mixer over simmering water, whisking constantly but gently, until temperature reaches 140 degrees F (60 degrees C), about 10 minutes. Return bowl to the stand mixer. Whisk sugar-egg white mixture in the stand mixer fitted with the whisk attachment until mixture is thick, glossy, and temperature of outside of bowl is room temperature. Change attachment to the paddle attachment and continue mixing on low speed. Add butter, 1 cube at a time; mix until silky-smooth. If mixture curdles, continue mixing and it will return to smooth. Pour vanilla extract and sprinkle salt into butter-sugar mixture; beat until fully incorporated. This delicious, creamy frosting makes any cake grand. Vinegar can replace the lemon juice if desired. If you don't have a candy thermometer, simmer the egg whites and white sugar until the sugar has completely dissolved and the egg whites are hot. You can feel a drop between your fingers to ensure no granules are left. You can use a bowl and whisk of you don't have a stand mixer. Wipe both with lemon juice. If buttercream is too runny, the butter was possibly too soft. Place into the refrigerator for about 15 minutes, then beat again. If still too runny, add a few more cubes of butter and keep beating until it reaches desired consistency. For chocolate buttercream, melt 1 1/2 cups bittersweet chocolate. Add to every 5 cups buttercream and beat until incorporated. 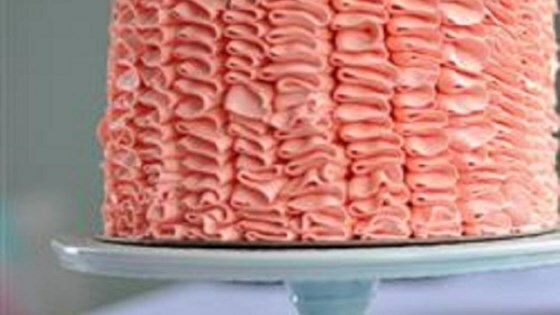 For strawberry buttercream, add about 1/2 cup strawberry puree to 5 cups buttercream and beat until incorporated. For vanilla bean buttercream, add 1 tablespoon vanilla bean paste or 1 vanilla bean for every 5 cups buttercream and beat until incorporated. It was very runny and I was not able to spread it. Don't worry if it's looking flat just keep going and finish the resepie. Only 3 words, BEST. FROSTING. EVER!!! Out of this world delicious! Don't be in a hurry to make it though. It's very time consuming but SO worth the wait. This is kind of a massive batch...Totally filled my 6 quart mixing bowl.